Ionized water is the product of mild electrolysis which takes place in the ionized water unit. The production of ionized water, its properties, and how it works in the human body are described in the next section. 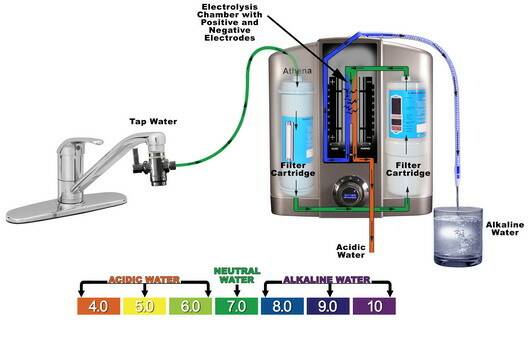 Ionized water is treated tap water that has been filtered and reformed to create reduced water with a large mass of electrons that can be donated to active oxygen in the body to block the oxidation of normal cells. Reduced Water -250 to -350mV 8 Strong reduction potential contains a mass of electrons that can be donated to free radicals. Oxidated Water +700 to +800mV 4 Strong oxidation potential, a shortage of electrons giving it the ability to oxidize and sterilize.